This rich shampoo offers superior body and life to fragile hair. It specifically includes all-natural ingredients that eliminate sebum build-up in the hair follicle and scalp. 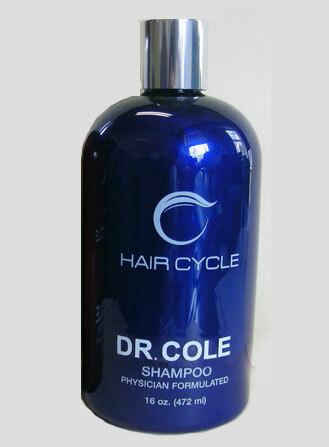 Ideal for everyone, HairCycle Shampoo is particularly suitable for post-procedure recovery. A salon-quality treatment, HairCycle Shampoo also has the added benefit of DHT inhibitors -excellent for helping with hair retention. HairCycle Shampoo also includes biotin and proteins. These add luster and thickness, better nourish the scalp, and encourage faster growth. A quality shampoo deserves quality materials. HairCycle Shampoo exclusively uses safe, all natural ingredients that promote the best looking, and thickest, hair possible. Apply to wet hair. Work into a rich lather. Leave on for two minutes to allow anagen stimulators to penetrate. Rinse and repeat. Purified Water, Polyglyceryl Laurate, Cocomidopropyl Betaine, Aloe Vera Gel, Hydrolyzed Wheat Protein, Arnica Montana, Extracts of Rosemary, Lavender, Saw Palmetto, Grapefruit Seed and Grape Seed, DI-Panthenol (Vitamin B5), Jojoba Oil, Tea Tree Oil, Alpha Lipoic Acid, Papain/Bromelain, Phenoxyethanol, Vitamin K, Biotin, Fragrance. This shampoo is wonderful! you will feel the difference from your first usage. I shower with the shampoo, apply the WNT hair spray before i go to bad and my hair feels great and fuller.